Successfully Added ZGPAX S99C Smart Watch Phone - 1 IMEI, 3G, WiFi, Bluetooth 4.0, Mic And Speakers, Pedometer, 5MP Camera, Quad-Core CPU (Black) to your Shopping Cart. Enjoy great connectivity from your wrist with the ZGPAX S99C smart watch phone. 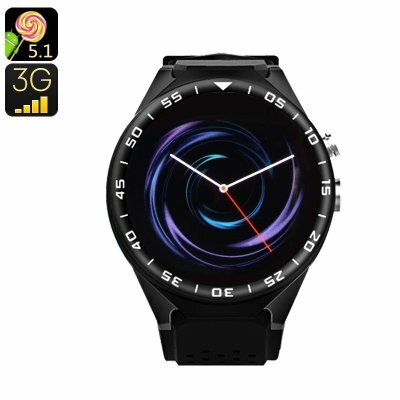 With its Android operating system and 1 IMEI number, this phone watch lets you enjoy all regular smartphone features at your wrist. It comes with a built-in mic and speaker. This means you’ll be able to listen to music and even engage in phone calls. On its 1.39-Inch touchscreen display, you’ll be able to enjoy your favorite media, Apps, and send messages. The phone watch even allows you to browse the web thanks to WiFi and 3G support. The watch itself features a remarkably stylish design. It has a premium look that is sure to fit any of your outfits. Along with its large display, this phone watch is sure to impress. Within its sleek body, you’ll find a Quad-Core processor and sufficient amount of RAM. Additionally, the watch comes with 4GB memory and a powerful 450mAh battery for hours’ worth of usage time. Whether you wish to make calls, browse the web, or simply check the time – this Android watch is sure to meet your demands. For all sports enthusiasts among us, the ZGPAX S99C smart watch phone comes with a pedometer, heart rate monitor and sedentary reminder. The smartwatch is furthermore life waterproof thanks to which you won’t have to be afraid of using it during your upcoming workout sessions. With a built-in 5MP camera, your smart watch phone lets you shoot crisp pictures and HD video of all those special moments in life. It furthermore supports Bluetooth connectivity that allows you to easily pair your Android watch with your iOS or Android phone. This phone watch comes with a 12 months warranty, brought to you by the leader in electronic devices as well as wholesale smart watches..